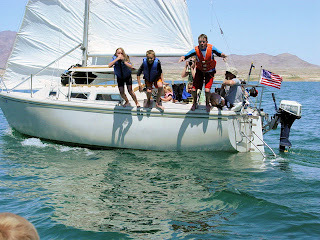 We spent several days sailing on Lake Mead, and it was easily one of the best vacations I have ever had. 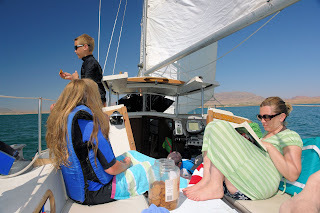 I forced myself to leave the cell phone in the car (not that I would expect to get coverage in the remote canyons of Lake Mead) and let myself get totally lost in family, wind, sails, and that incredibly blue water. We ran into a bit of trouble launching the boat. 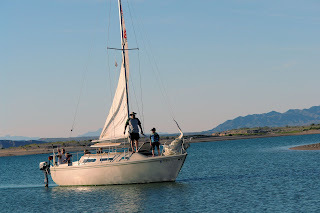 Loaded down with several days' camping gear, our Catalina 25 probably weighed several hundred pounds more than usual, and when you add our crew of 8 hearty sailors, well, let's just say we wet a new Plimsoll line. The water was fairly low at the Echo Bay Marina, and the prop wash from all the power boats left odd ruts that prevented us from getting the trailer deep enough. So I fired up the outboard to pull the boat back. About that time I realized that water was not draining from the motor, which meant the engine wasn't cooling properly. Great start to a vacation! With my 14 year old son in the water (that disrespectful boy grew taller than me this year), and my younger brother (that disrespectful boy outgrew me 20 years ago) we were finally able to shove the boat off the trailer. Now there is a narrow channel leading from the boat ramp to the open waters of Overton Arm, and most of the time the wind blows straight from Overton Arm right up the boat ramp. So heading out of the marina under sail would have required some very rapid tacking, which would have been too stressful for us having already had a bad start. So we opted to have my brother tow us out into the Arm with his very impressive ski boat. Once in the channel, we stowed the towing line, raised the main and jib, and cut along to the north at a steady 6 knots. We were running (sailing downwind), and when we deployed the whisker pole to hold the jib out, we picked up an additional knot. The wind quickly blew the launch stress away and within about 10 minutes everyone was relaxed and happy. My brother had zipped ahead out of site to reconnoiter the coves and bays in search of a campsite, planning to radio us with the location. The middle two, ages 1o and 12, went up onto the foredeck and rested in the shade of the jib as we cruised along. My wife, oldest son and I sat in the cockpit. I was thinking about the outboard, wondering if it would be fixable for use on the rest of the trip. My oldest son (14) was trying to adjust to life without texting. And my wife was buried in Stephenie Meyers' "New Moon", a book she picked up at Wal-Mart on the way down. About an hour later, my sister-in-law showed up in the ski boat and gave us a description of where the cove was, and asked if we wanted a tow. But the sailing was so great, I secretly hoped the cove was still several hours away. Within half an hour we entered the bay where our campsite would be. As we got closer, we realized that the wind was blowing directly out of the narrow cove we needed to sail into. The cove was about 100 yards wide at the mouth and perhaps 300 yards long. I hollered to the crew on the foredeck to stow the whisker pole and make ready for some fast tacking. My oldest son readied the jib sheets, and I took the helm. Our first tack was a little rough, but we left plenty of room to 'bail out' if needed before we hit the shore. The second tack was much smoother, and by the third tack, we all felt like we were ready to take away Larry Ellison's BMW sponsorship in the next America's Cup. We gained about 25' with every tack, slowly approaching the shore at the end of the cove. I believe the most difficult job belonged to my 10 year old daughter, self-proclaimed "Winch Wench", with an uncanny feel for how much swing keel cable needs to be taken in as we approach the beach to prevent running aground and losing steerageway in the narrowing cove. I don't know how long the tacking lasted, I just know that we all enjoyed it so much we could have tacked another 3 hours and thoroughly enjoyed it. As a Skipper, it was great to see us all building sailing skills. As a Dad, I loved seeing my kids all pulling together and complimenting one another as they proudly performed each task together. There is nothing like sailing to bring a family together.